Take the music home: Purchase the 1998 CD, "Memories of Scottish Weekend" and/or "More Memories of Scottish Weekend," from 2002. CDs may be purchased at SW. 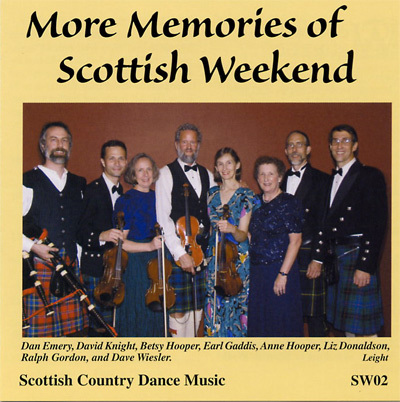 In 1998 Scottish Weekend, Inc., produced the CD Memories of Scottish Weekend as a souvenir of its annual weekend of Scottish country dancing in Maryland. This recording of a ball enjoyed by 150 dancers provided lift and excitement seldom heard on studio recordings. Due to its popularity, this sequel, More Memories of Scottish Weekend, has been produced from a recording of the ball in 2002. The Scottish Weekend Committee gives special thanks to the musicians, composers, and sound engineers who created this second variety-filled and highly danceable CD. This ensemble consisting of Liz Donaldson, Dan Emery, Earl Gaddis, Ralph Gordon, Anne Hooper, Betsy Hooper, David Knight, and Dave Wiesler is unique to Scottish Weekend 2002. Each Scottish country dance is listed by name and type (jig, reel or hornpipe, strathspey, or waltz) followed by its source. All tunes are traditional unless otherwise indicated. All arrangements are by Liz Donaldson. 1. Hornpipes Suitable for Catch the Wind 8x32H 4'56"
2. The Jubilee Jig 8x32J 4'55"
3. Asilomar Romantic 8x32S 8'43"
4. Duke of Atholl's Reel (Pipes) 8x32J 4'57"
5. Denise's Waltz 5x32W 3'53"
6. The Royal Deeside Railway 8x32R 4'52"
7. Set of Strathspeys 3x32S 3'20"
9. Round Reel of Eight 1x88R 1'52"
10. Gypsy Weaver 8x32S 8'24"
11. EH3 7AF 8x32J 4'46"
12. Balquidder Strathspey 8x32S 8'40"
13. The Mason's Apron 8x32R 4'49"
14. Bonnie at Morn 4x32W 3'17"
This CD captures the spirit of a Scottish country dance ball and is enjoyable for both listening and dancing. Recorded and mastered by Flawn Williams. Duplicated by Oasis. Artistic Director Liz Donaldson. Technical Advisor Ralph Gordon. Producer Marty King. The Scottish Weekend Ball recorded live on September 28, 2002. With special thanks to program devisor Margaret Grandine, photographers Mel Briscoe and Ned Leight, advisor Ellie Briscoe, sound engineers John Bartholomew and Tom Bryson, and researcher Elke Baker. © 2003 Scottish Weekend, Inc.
$15 each plus $2.50 shipping, or 2 for $25 plus $3.00 shipping. Please inquire for large quantities. Please include your mailing address and specify "More Memories of Scottish Weekend." Note: You may combine orders for "More Memories of Scottish Weekend" and "Memories of Scottish Weekend". For example, the total for one each is $28.00 ($25 for 2 plus $3.00 shipping/handling).